LUMEN is Latin for light, or an opening. It also refers to a measure of light as perceived by the eye. 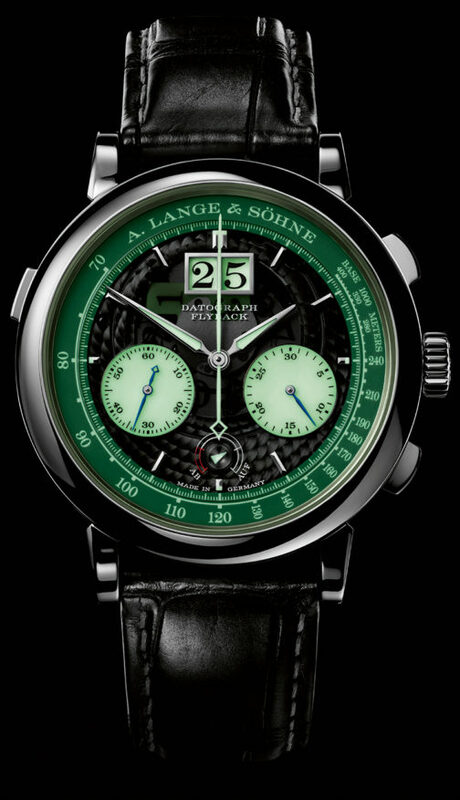 Going by these definitions, it doesn’t make much to figure out what the new A. Lange & Sohne Datograph Up/Down Lumen is all about. And what’s it about, basically, is the capacity to glow in the dark. Lange’s response to a self-imposed goal of improving on its already excellent Datograph (launched in 1999) was the Datograph Up/Down of 2012. 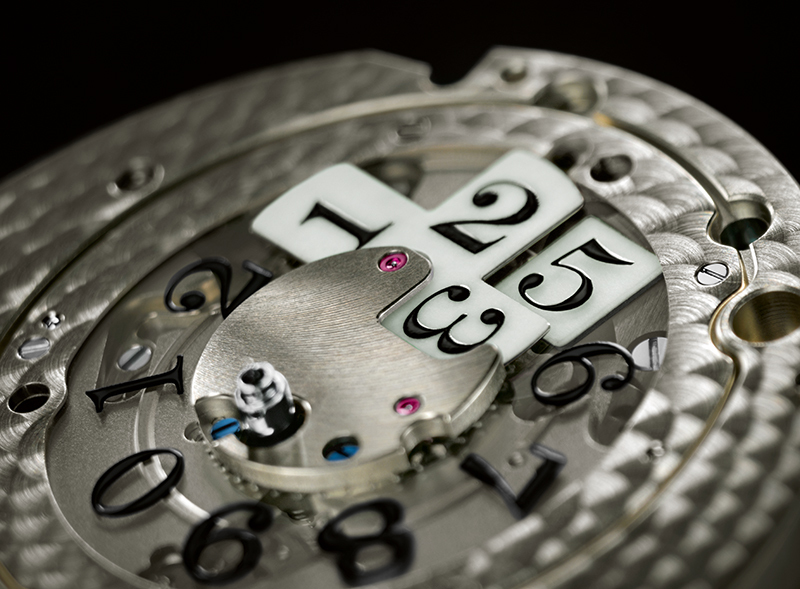 The piece built upon the Datograph’s vaunted chronograph flyback function, which can stop, reset and restart the counter via a press of a single button (the one at 4 o’clock}, as well as measure different sets of time simultaneously. It also has a jumping minute counter, which advances precisely at the point where the chronograph’s sweeping second hand passes over it. 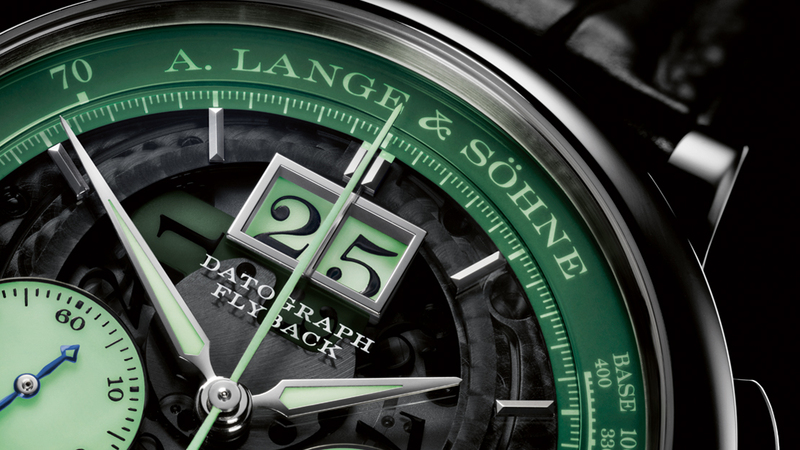 What the Datograph Up/Down added to its portfolio is a power reserve indicator that’s marked “Auf,” for Up, meaning the watch is fully wound, and “Ab,” for Down. 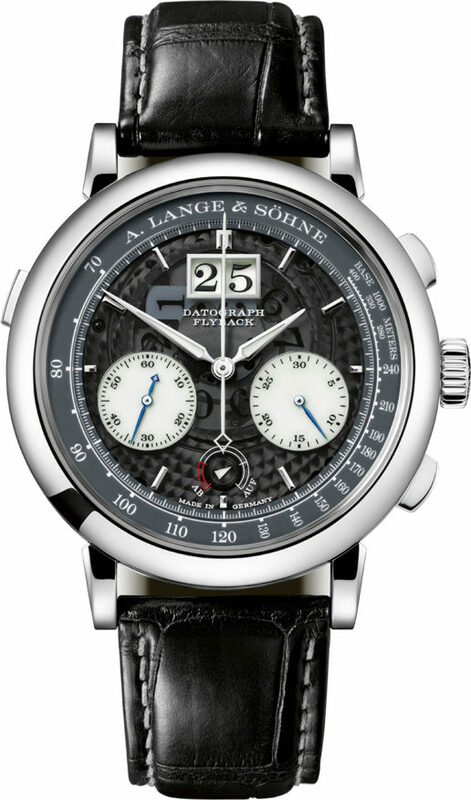 Only three other A. Lange & Sohnes have previously received the Lumen treatment; a Zeitwerk from 2010, the Grand Lange 1 in platinum of 2013 and the Grand Lange 1 Moon Phase of 2016. As with the new Datograph Up/Down Lumen, what defines the Lumen feature is a coating of phosphorescent pigments on the dark and translucent sapphire crystal dial. The coating takes most of the visible light out, but not those on the UV spectrum that’s needed for it to glow. As a result, all the readouts on the watch are lighted up in places by a green hue that contrasts highly against the pitch-dark backdrop even while remaining soft enough to the eye — dazzling it’s not. Particularly lit are the wide minute track and tachymeter scale surrounding the dial, as well as the two chronograph sub registers. 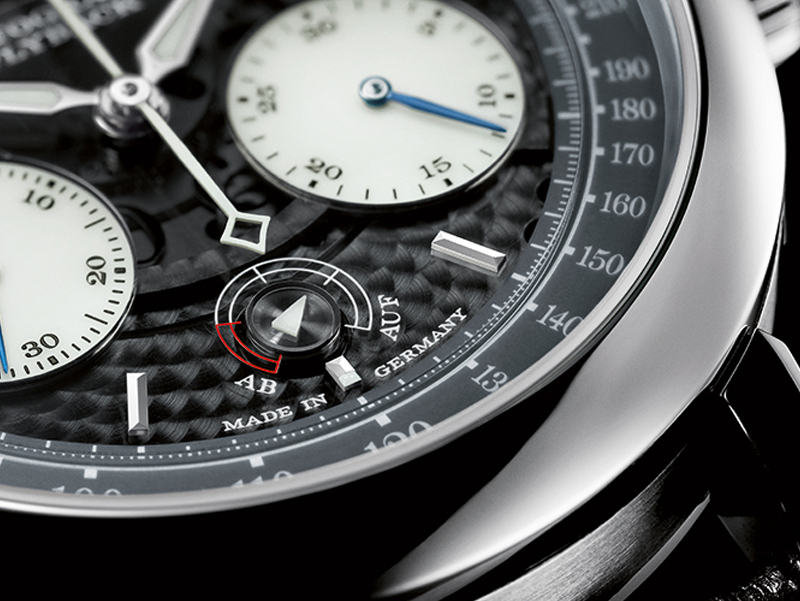 Matching the dial’s light show are the equally luminescent hour, minute, chronograph and power reserve indicator hands. Interestingly, left unlit are the hour indices. The blued hands for the small seconds and 30-minute counter are not luminescent either, but remain quite visible in the dark simply because the subdials on which they are set are finished in white, rather than translucent, and also glow in the dark. As one of A. Lange & Sohne’s signature elements, the Datograph Up/Down Lumen’s oversized date display rightfully gets the spotlight trained on it. Well, to be precise, it actually emits its own light as the date wheel that’s made of clear glass and the cross on which the “tens” of the date are printed rotate above a luminous background (the cross itself is luminous). This means the date display is almost always glowing, whether brightly in the dark, or faintly in daylight. Matching the translucent sapphire crystal dial, which allows for a peek of the watch’s movement beneath it, is a completely clear sapphire crystal caseback, which displays the stunning — stunning — A. Lange & Sohne handwound cal. L951.7. Mixing together untreated German silver with steel and a host of brightly colored materials like rubies, blued screws and gold, each of the movement’s 454 parts has been lavished with a variety of finishing techniques — most of which done by hand. The cal. 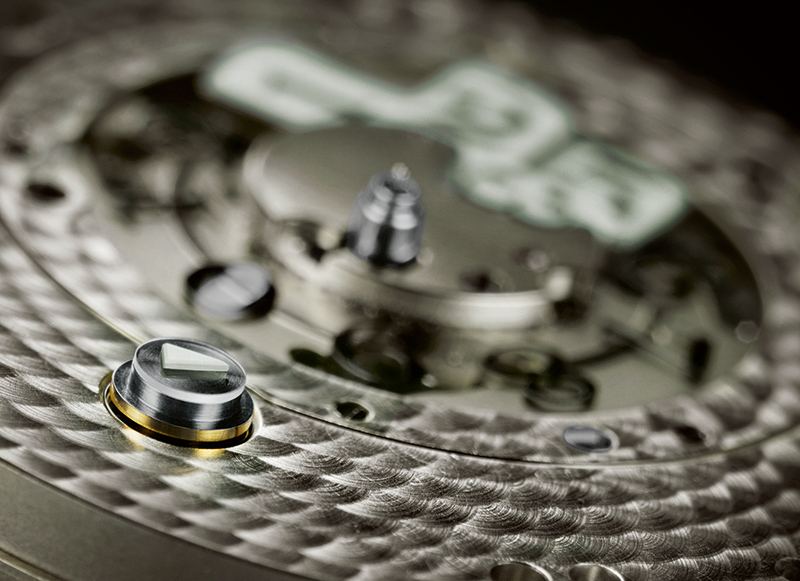 L951.7 is helped run by a proprietary cam-poised balance wheel and an in-house hairspring, has 46 jewels, spins at 18,000vph, and can tick for at least 60 hours when fully wound. Housing all this — movement, dial, lighting wizardry — is a relatively subdued 41-millimeter platinum case that’s complemented by a black alligator hide strap, in turn locked in place by a prong buckle that’s also made from platinum. 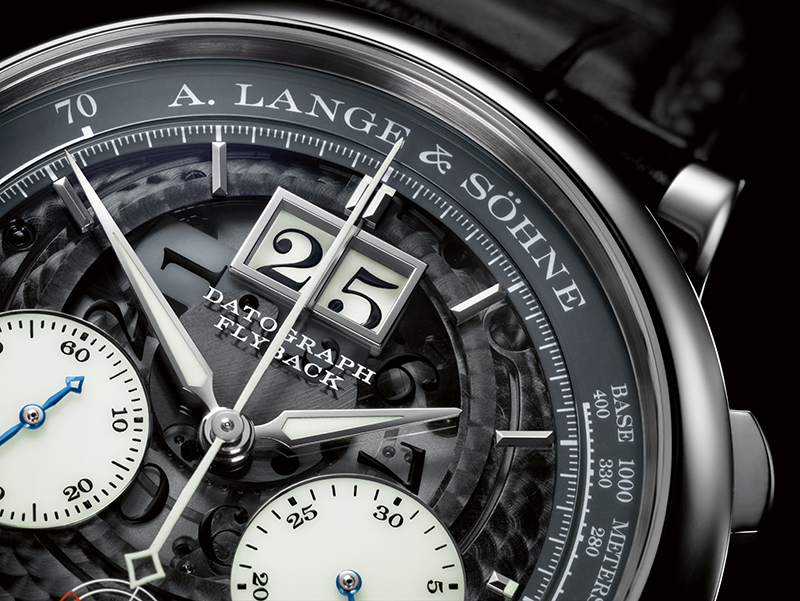 Like the Grand Lange 1 Lumen models, the Datograph Up/Down Lumen is limited to only 200 very illuminating pieces.